A Life at Stake is a riveting and fascinating portrait of the legendary Mayakovsky, a poet surrounded by many myths. With considerable insight and a light touch, Bengt Jangfeldt describes not only a great but tragic human life, but also an entire era in the dark history of the Soviet Union. It is the story of a poet who, after the 1917 revolution, became the foremost herald of Communism, who loved the revolution, but at the age of 36 took his own life, disappointed in the development of Soviet society and ravaged by private conflicts. Mayakovsky most certainly lived with his life at stake; he was full of burning enthusiasm for the time in which he lived, but was met with coldness or antagonism from the side of the authorities. He praised his muse, Lili Brik, in some of the most beautiful love poems in Russian literature. The relationship between Mayakovsky, Lili and her husband is one of the most legendary in the history of Russian literature. 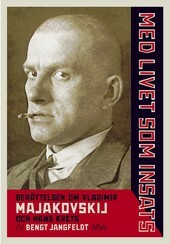 A Life at Stake is based to a great extent on previously unknown source material, and is the first comprehensive biography of Mayakovsky in any western language.